We loved this chicken chili so much that I made it several times in the weeks following this post. I love that you can make it in the crock pot or on the stove, whatever fits your schedule best! 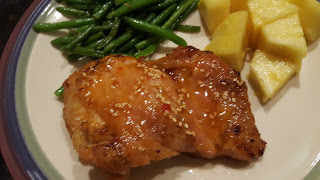 I love how chicken thighs turn out when cooked in the pressure cooker. And now I like them even better when they're placed under the broiler for a few minutes to really "seal in" the flavors and texture. Now I can use this "method" with all different sauce adaptations - it's a whole new world! 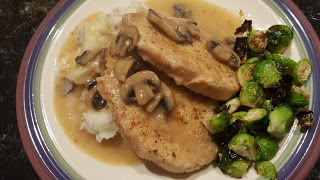 As I mention in the original post, I've never been a huge fan of pork chops because it is so difficult to cook them well. Not anymore! They turn out beautifully in the Instant Pot - and they are tender enough to cut with a fork! If you don't care for mushrooms, just leave them out - this dish will still elicit tons of praise at your dinner table! I love my Instant Pot too Sara and have been having a lot of fun with it. The pork chops look incredible! I love white chicken chili, so I know I'd love that. I'm definitely intrigued by the sweet chile chicken too. Great roundup!